Over time, an asparagus plant will grow into a tangled mess of roots if you do not transplant some of the asparagus crowns to a new growing location. While the task of digging up the asparagus crowns can seem unpleasant, the harvest that returns following the transplant will more than make up for your effort. Transplant asparagus crowns in the early spring before the plants break dormancy or in the autumn. 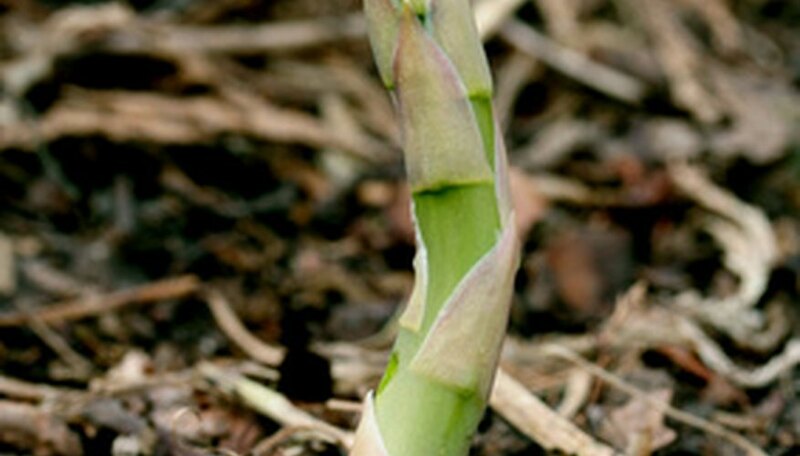 You will renew your asparagus planting bed with new life. Spread the tarp near the asparagus growing site to hold the plants as your remove them from the soil. Insert the tines of the garden spade approximately 6 inches away from the outside perimeter of the asparagus plants. Continue removing the garden spade tines from the soil and reinserting them into the soil around the entire perimeter of the asparagus until you loosen the roots from the soil. Angle the garden spade under the tines to begin lifting the asparagus plants out of the soil. Transfer the entire plant system to the tarp when you remove it from the soil. This step may take two people, each working with a garden spade, depending upon the size of your asparagus clump. Remove as much soil as possible from the roots by shaking the plants gently. If the soil clings stubbornly, spray a hose at the root system to remove the soil. Break apart the crowns with your hands if the roots will separate easily. Discern the parent crown and the offshoots growing around it--the offshoots are smaller. Break off the offshoots from the parent crown. If the root mass is too tangled and large, cut them apart with the knife. Try to salvage as many crown as possible, but you may ruin some crowns during the separation process. Prepare a new planting area for the separated asparagus crowns. Cultivate the soil with the garden spade down to a depth of 6 to 8 inches. Add 1 to 2 inches of compost to the soil to improve it, if you desire. Dig holes to plant the asparagus crowns so the tops of the crowns are approximately 3 inches below the soil. Make the holes 1 1/2 to 2 1/2 feet apart and make each row between 3 and 5 feet apart. Place the asparagus crowns into the prepared holes and fill the soil in around the root systems to transplant the asparagus. Firm the soil down with your hands. Give a generous watering immediately after you finish transplanting the asparagus crowns.